Looking for a quick midweek dinner to make, look no further. This pasta is not only quick to make it tastes amazing. 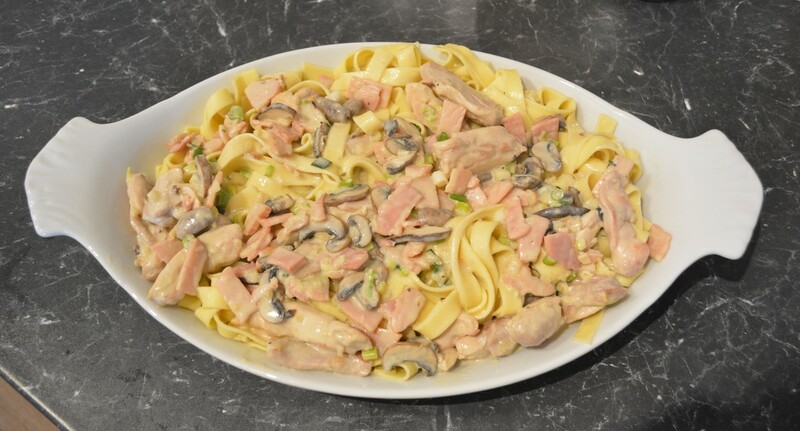 The combination of chicken, bacon, garlic, cream, and shallots is just delicious. 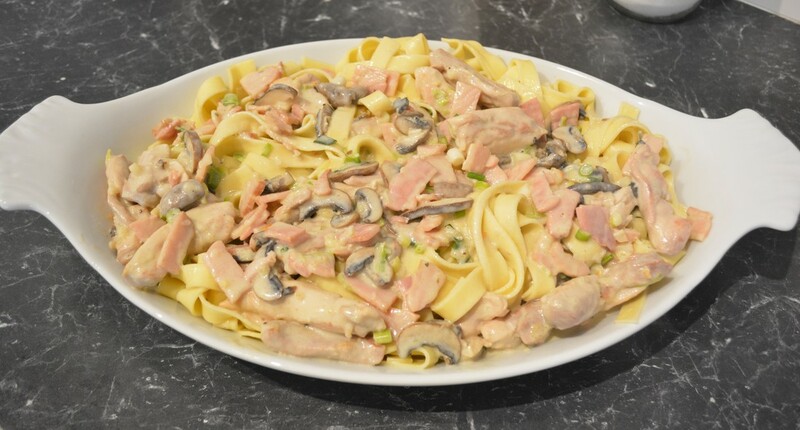 My husband was someone who when I met him said he did not like creamy pasta sauces, he loved this, he has now converted into a creamy pasta eater and really enjoys it. My kids cannot get enough of this, if there are leftovers, they want it for school the next day. Any type of dried or fresh pasta can be used here. To make the herb bread: Combine 120g butter (softened) with 1/2 cup chopped mixed fresh herbs and a finely chopped garlic clove. Slice a medium breadstick diagonally; spread each piece with the herb butter. Reshape into a loaf, wrap in aluminium foil and bake in a moderate 180C oven for 30 minutes or until the loaf is crisp and hot. My family love it hope yours does to. Trim chicken of excess fat and sinew. Cut chicken into thin strips. Heat oil and butter in a heavy based frying pan; add chicken and cook over a medium heat for 3 minutes or until browned. Ad bacon, garlic and mushrooms; cook over a medium heat for 2 minutes, stirring occasionally. Add wine and cook until the liquid is reduced by half. Add the vegeta, cream and shallots and bring to the boil. Blend the flour with the water until smooth. Add to the pan and stir over heat until the mixture boils and thickens; reduce the heat and simmer for 2 minutes. Season to taste. Cook fettuccine in a large pan of rapidly boiling water. Once cooked, reserve 1/2 cup of the pasta water, then drain the fettuccine. Add the pasta water to your sauce along with the fettuccine and stir until combined. ​Serve immediately with a green salad and hot herb bread.